Dependent of it whether you use an ISDN-or a VoIP connection with the PBX / gateway, the following configurations are necessary. The controllers can be marked "Active" and therewith configured for the use by ixi-UMS Business. If you use the XCAPI you can change the used lines. These must have the same number like in the XCAPI and the PBX / gateway furnished. In this case, you can enable the controllers individually, but you can not change the number of channels. There are 2 channels per controller. The next step is to set up the connection type. Please determine here, how many channels shall be used for the reception exclusively. 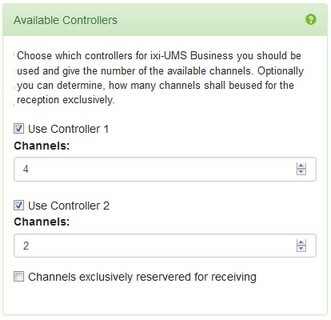 It is not possible to determine, which channels are reserved, because this is managed by the ixi-UMS Business Server independently.